The Raman application is used by researcher doing Raman Spectroscopy to convert between various units like wavenumber, nanometers, gigahertz or electron volts. You set the excitation wavelength and the signal wavelength in nanometers and Raman gives you the Raman shift expressed in wavenumber ( cm-1), GHz and meV. 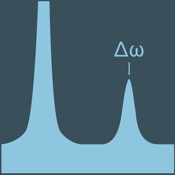 Or you can enter a Raman shift and get the signal wavelength for the given excitation. These are just a few examples. You can change any of the values and the rest updates.